Fresh high quality fruits are used in producing this product. The manufacturing process is modern and controlled to ensure food safety and consistent quality. No chemical substances or artificial flavours are used which give these products their natural flavour and colour. These dried fruits are nutritious and fit for all ages. They are crispy and very delicious to eat as snacks. Ingredients: Jackfruit, Sweet Potato, Banana, Pineapple, Taro, Corn Oil. 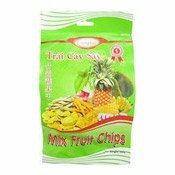 Simply enter your details below and we will send you an e-mail when “Mix Fruit Chips (Trai Cay Say) (綜合蔬果脆片)” is back in stock!